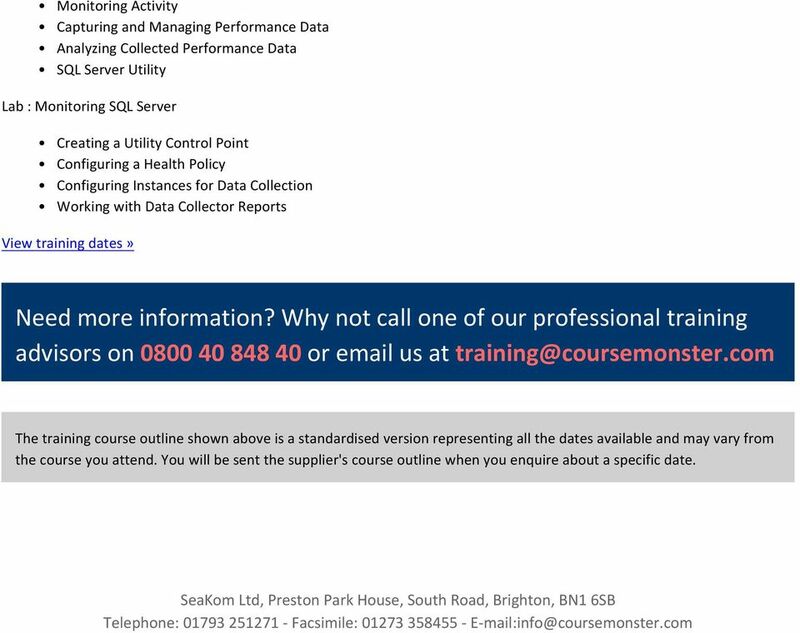 Download "Microsoft SQL Server 2014: MS-20462 SQL Server Administering Databases"
1 coursemonster.com/uk Microsoft SQL Server 2014: MS SQL Server Administering Databases View training dates» Overview This five-day instructor-led course provides students with the knowledge and skills to maintain a Microsoft SQL Server 2014 database. The course focuses on teaching individuals how to use SQL Server 2014 product features and tools related to maintaining a database. Audience The primary audience for this course is individuals who administer and maintain SQL Server databases. These individuals perform database administration and maintenance as their primary area of responsibility, or work in environments where databases play a key role in their primary job. 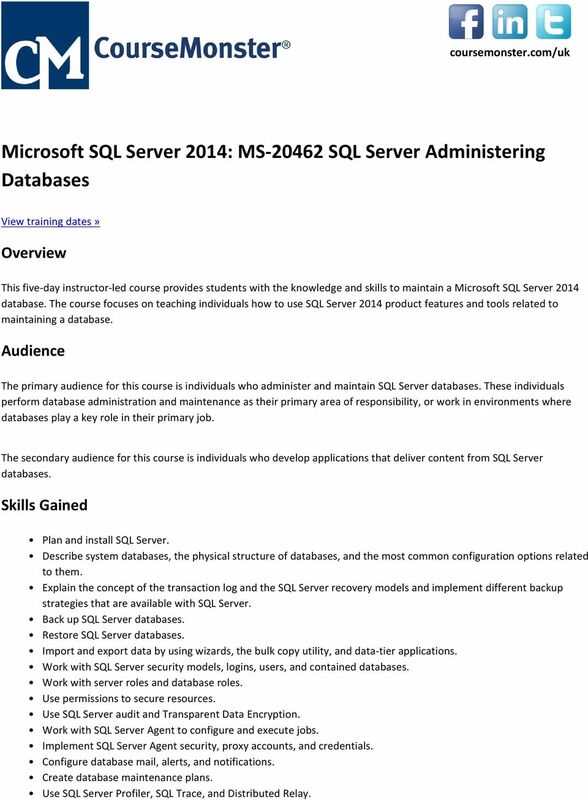 The secondary audience for this course is individuals who develop applications that deliver content from SQL Server databases. Skills Gained Plan and install SQL Server. Describe system databases, the physical structure of databases, and the most common configuration options related to them. Explain the concept of the transaction log and the SQL Server recovery models and implement different backup strategies that are available with SQL Server. 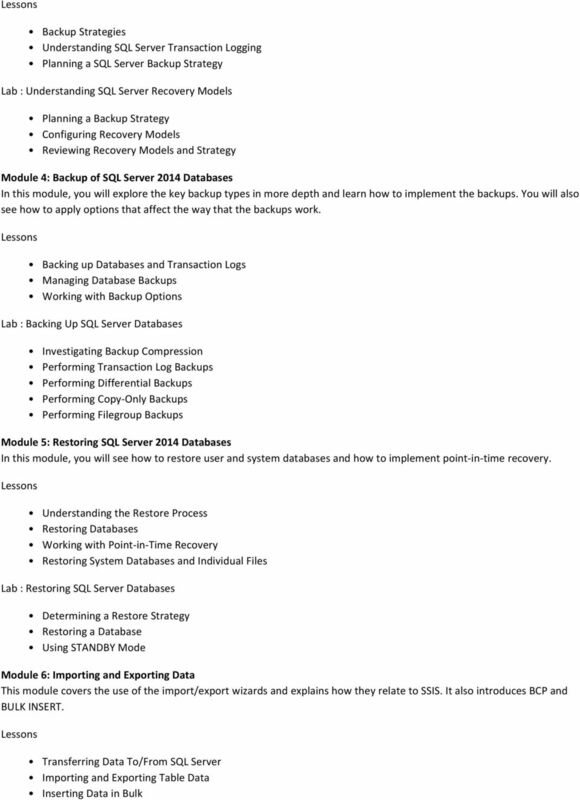 Back up SQL Server databases. Restore SQL Server databases. Import and export data by using wizards, the bulk copy utility, and data-tier applications. 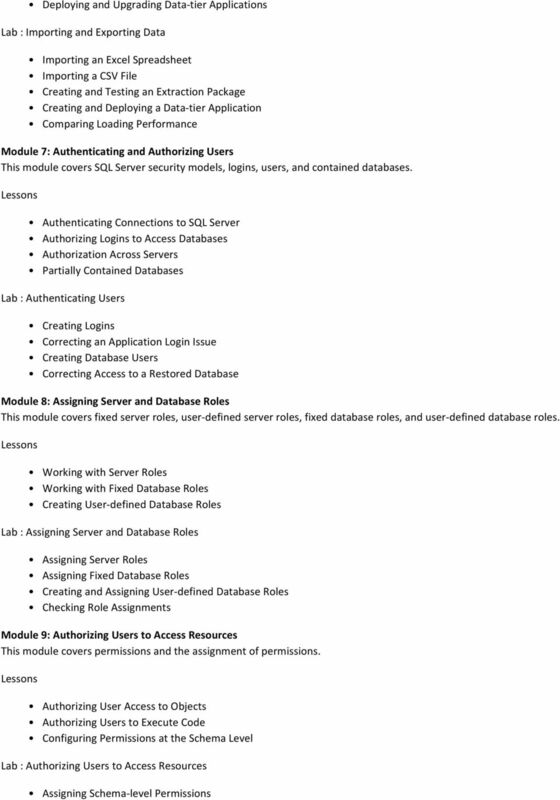 Work with SQL Server security models, logins, users, and contained databases. Work with server roles and database roles. Use permissions to secure resources. Use SQL Server audit and Transparent Data Encryption. Work with SQL Server Agent to configure and execute jobs. 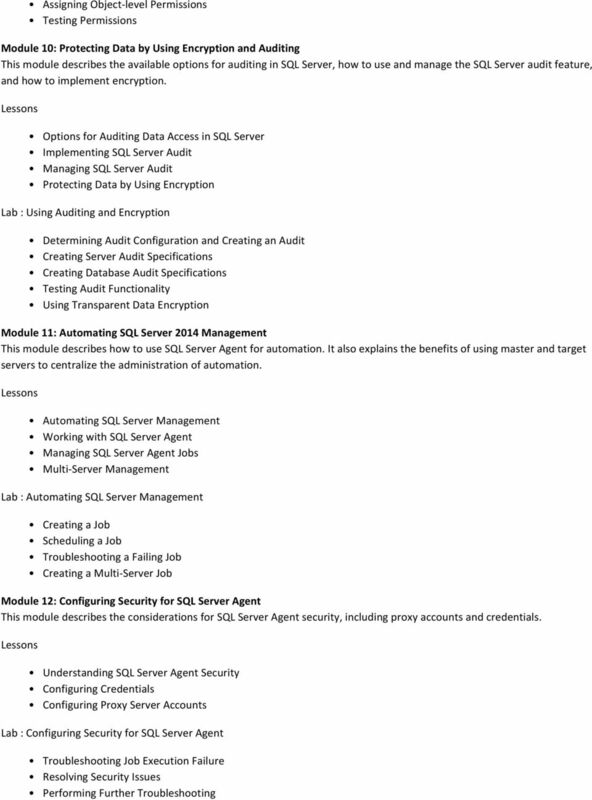 Implement SQL Server Agent security, proxy accounts, and credentials. Configure database mail, alerts, and notifications. 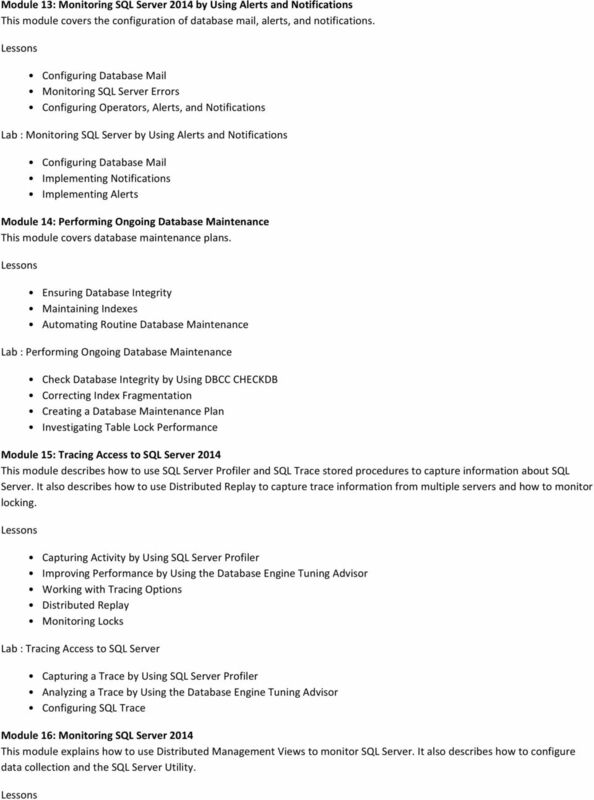 Create database maintenance plans. Use SQL Server Profiler, SQL Trace, and Distributed Relay. 2 Use Distributed Management Views and configure data collection. Prerequisites Basic knowledge of the Microsoft Windows operating system and its core functionality. Working knowledge of Transact-SQL. Working knowledge of relational databases. Some experience with database design. 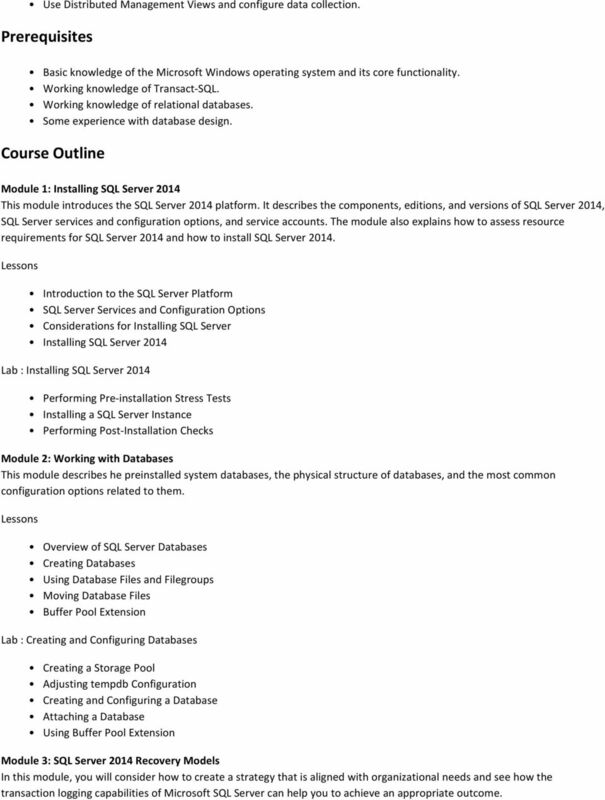 Course Outline Module 1: Installing SQL Server 2014 This module introduces the SQL Server 2014 platform. It describes the components, editions, and versions of SQL Server 2014, SQL Server services and configuration options, and service accounts. The module also explains how to assess resource requirements for SQL Server 2014 and how to install SQL Server Introduction to the SQL Server Platform SQL Server Services and Configuration Options Considerations for Installing SQL Server Installing SQL Server 2014 Lab : Installing SQL Server 2014 Performing Pre-installation Stress Tests Installing a SQL Server Instance Performing Post-Installation Checks Module 2: Working with Databases This module describes he preinstalled system databases, the physical structure of databases, and the most common configuration options related to them. Overview of SQL Server Databases Creating Databases Using Database Files and Filegroups Moving Database Files Buffer Pool Extension Lab : Creating and Configuring Databases Creating a Storage Pool Adjusting tempdb Configuration Creating and Configuring a Database Attaching a Database Using Buffer Pool Extension Module 3: SQL Server 2014 Recovery Models In this module, you will consider how to create a strategy that is aligned with organizational needs and see how the transaction logging capabilities of Microsoft SQL Server can help you to achieve an appropriate outcome. 6 Module 13: Monitoring SQL Server 2014 by Using Alerts and Notifications This module covers the configuration of database mail, alerts, and notifications. Configuring Database Mail Monitoring SQL Server Errors Configuring Operators, Alerts, and Notifications Lab : Monitoring SQL Server by Using Alerts and Notifications Configuring Database Mail Implementing Notifications Implementing Alerts Module 14: Performing Ongoing Database Maintenance This module covers database maintenance plans. Ensuring Database Integrity Maintaining Indexes Automating Routine Database Maintenance Lab : Performing Ongoing Database Maintenance Check Database Integrity by Using DBCC CHECKDB Correcting Index Fragmentation Creating a Database Maintenance Plan Investigating Table Lock Performance Module 15: Tracing Access to SQL Server 2014 This module describes how to use SQL Server Profiler and SQL Trace stored procedures to capture information about SQL Server. It also describes how to use Distributed Replay to capture trace information from multiple servers and how to monitor locking. Capturing Activity by Using SQL Server Profiler Improving Performance by Using the Database Engine Tuning Advisor Working with Tracing Options Distributed Replay Monitoring Locks Lab : Tracing Access to SQL Server Capturing a Trace by Using SQL Server Profiler Analyzing a Trace by Using the Database Engine Tuning Advisor Configuring SQL Trace Module 16: Monitoring SQL Server 2014 This module explains how to use Distributed Management Views to monitor SQL Server. It also describes how to configure data collection and the SQL Server Utility.